Citation: Siva Kumar S, Ranjan RV, Nikithamani A, et al. 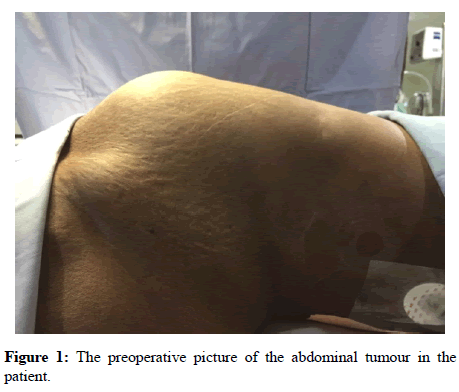 Anaesthetic management of a case of large retroperitoneal leiomyosarcoma. Anesthesiol Case Rep. 2018;1(2):27-29. Leiomyosarcoma is an aggressive soft tissue sarcoma derived from smooth muscle cells. Sarcomas are malignant tumors arising from mesenchymal cell lines and comprise a heterogeneous group of cancers, each with unique clinical, histologic, and radiographic characteristics. Soft tissue sarcomas account for 0.7% of malignancies and of all soft tissue sarcomas, approximately 5-10% are leiomyosarcomas . The prognosis is poor, with survival rates among the lowest of all soft tissue sarcomas . Women are affected more than men (2:1) with the disease typically occurring in the 5th and 6th decades of life. This gender distribution may reflect the proliferation of smooth muscle that can occur in response of oestrogen. Prognosis and treatment varies on the location, stage and grade of the primary tumour as well as the presence of metastatic disease. The most common site of involvement of leiomyosarcoma is the retro peritoneum, accounting for approximately 50% of occurrences . The treatment options for leiomyosarcoma are surgery, radiation therapy and chemotherapy depending on the tumour grade. In case of retroperitoneal tumours, presenting signs and symptoms can include abdominal mass, pain, swelling, weight loss, nausea or vomiting. Leiomyosarcoma, like other soft tissue sarcomas, often present as an enlarging, painless mass. We present a case of leiomyosarcoma who presented with similar complaints and the successful anaesthetic management of the same. A 48 year old female diagnosed with a large retroperitoneal mass was scheduled for exploratory laparotomy and tumour excision (Figure 1). She suffered from abdominal pain, weight loss and loss of appetite for the past 6 months. Her computed tomography of abdomen showed an ill-defined heterogenous retroperitoneal mass measuring 200 mm × 187 mm × 45 mm extending from D12 to S1 vertebra involving pre, para aortic and pre, para caval vessels, abutting the anterior abdominal and encasing the left renal vessels (Figure 2). Figure 1: The preoperative picture of the abdominal tumour in the patient. Figure 2: Computed tomography of the abdomen showing a huge lobulated tumour measuring 200 mm × 187 mm × 45 mm and compressing the bowel loops and encasing the major blood vessels with extension to the left renal area and abutting the anterior abdominal wall. Her pre anesthetic evaluation did not reveal any abnormalities except for low haemoglobin of 9 gm/dL. Her preoperative vitals were Heart rate (HR) of 86 bpm, blood pressure of 110/60 mmHg and Spo2 (oxygen saturation) of 98% in room air. On anticipation of prolonged surgery and major blood loss, she was started on incentive spirometry two days before surgery and adequate blood products were reserved. On arrival to operating room, she was started on large bore IV cannula (16G) on the right hand and standard ASA monitors like Electrocardiogram (ECG), Non-invasive blood pressure monitoring, Pulse oximetry and capnography were attached. Epidural catheter was secured in T10-11 interspace and left radial artery was cannulated under local anesthesia using 20G cannula for beat to beat monitoring of blood pressure. Anaesthesia was then induced by standard anesthesia protocol and anesthesia was maintained with O2, N2O and sevoflurane. Right internal jugular vein was cannulated after securing the airway for CVP monitoring and administration of vasoactive drugs. Temperature monitoring was done through nasopharyngeal probe. Intraoperative analgesia was provided by epidural morphine 5 mg and intermittent boluses of fentanyl. Fluid warmers were connected for large volume resuscitation without causing hypothermia. Active surface warmers also kept to prevent hypothermia. The total surgical time lasted for 480 mins and the blood loss was calculated to be approximately 3500 mL. The tumour was planned for enbloc resection but due to its invasiveness and adherence to major vessels initial debulking of the tumour was done followed by resection of the remaining tumour. The tumour weighed 4.5 Kg (Figure 3). 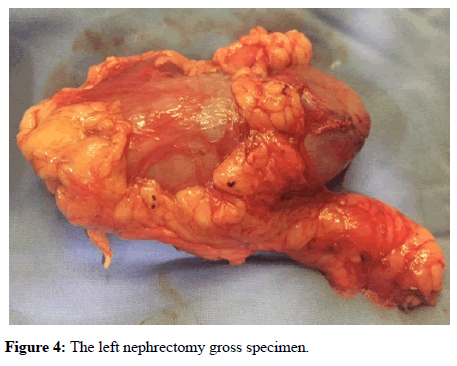 Due to involvement of left renal vessels, left nephrectomy was also done along with tumour resection (Figure 4). Figure 4: The left nephrectomy gross specimen. The surgery involved a multidisciplinary team of surgeons, urologist and vascular surgeon. During the perioperative period 12 blood products (6 PRBC’s and 6 FFP’S) were transfused along with 5000 mL of crystalloids and 1000 mL of colloids. Patient was started on low dose norepinephrine at the end of surgery for hypotension. After completion of surgery she was shifted to ICU for overnight elective ventilation and she was extubated next day morning. Epidural infusion was started for postoperative analgesia with 0.0625% bupivacaine + 2 m Mcg/mL fentanyl at a rate of 5 mL/h. Patient was transfused with 100 mL of 25% albumin on POD 1st and POD 2nd day. Norepinephrine was slowly tapered and discontinued and patient was discharged after two weeks without any complications. Leiomyosarcoma are notorious for vascular spread, fast growing and highly vascular tumour. Patients with large retroperitoneal tumours are at risks of greater perioperative morbidity and mortality due to its close proximity to major blood vessels and chances of life threatening haemorrhage which requires proactive and meticulous anesthetic management [4-11]. The main anesthetic concerns for our patient were i) the giant tumour may compress the major vessels causing haemodynamic perturbations. ii) Bleeding diathesis due to high vascularity and proximity to major blood vessels. iii) Mass affect causing splinting of the diaphragm and decreasing the lung compliance. iv) To prevent acute kidney injury in view of solitary kidney. The main concern in our case was the haemorrhagic shock caused by profuse bleeding from the surgical site. It is a life threatening condition causing haemodynamic instability with decreased tissue perfusion and hypoxia causing organ damage and even death. We addressed this concern by contacting the blood bank and ensured adequate blood products were reserved. We anticipated major blood loss during surgery, so secured two large bore cannulas along with the central line. We made available fluid warmers to transfuse large volume of fluids without causing hypothermia which may worsen the coagulopathy. We also made our decision regarding the use of blood products and at what ratio to be transfused. Traditionally in a heavily bleeding patient, the approach will be to transfuse large volume of crystalloids or colloids until the RBC transfusion is absolutely necessary [12-14]. FFP Transfusion will be done after 4 or more PRBC transfusion. This method of transfusion was counter-productive causing more bleeding and coagulopathy, Borgman et al. on his landmark study changed the concept of blood transfusion in a massively bleeding situation with a ratio of PRBC: FFP as 1:1 which drastically reduced the mortality rate. We also followed the same strategy and transfused PRBC’s and FFP in the ratio 1:1 which yielded good results with stable haemodynamics and no coagulopathy postoperatively. The problems with massive transfusion were acidosis, hypothermia, coagulopathy, hypocalcemia and TRALI (Transfusion related acute lung injury). Fortunately our patient did not show any complications of massive transfusion. 20 mL of 10% calcium gluconate was given intraoperatively to mitigate hypocalcemia. The core temperature was monitored throughout the surgery and it was maintained around 36°C. We also ensured that urine output was maintained around 1 mL/Kg/h. A low dose norepinephrine was started towards the end of surgery to maintain a mean arterial pressure above 65 mmHg to improve renal perfusion and to mitigate the vasodilation produced by volatile anaesthetics and inflammatory mediators released due to tissue handling. Prompt and meticulous anaesthetic technique with vigilant monitoring and good anticipation were necessary for the successful management of these types of cases as the margin of safety is very minimal and patient may deteriorate very soon leading to permanent damage to vital organs. The patient was advised for radiotherapy and regular follow up by the surgeons. Acute surgical bleeding is a medical emergency with high mortality if it leads to acute hypovolemic shock during surgery, hence requiring prompt and effective treatment. It may also lead to coagulopathy, due to consumption and dilution of clotting factors, which may be worsened by hypothermia and acidosis. Hence control of bleeding, supportive treatments for the maintenance of adequate tissue perfusion and oxygenation, maintaining normothermia, correction of anaemia, acidosis and electrolyte abnormalities, and the use of appropriate blood products to correct coagulopathy are the key points in the successful management of this case. Gustafson P, Willen H, Baldetrop B, et al. Soft tissue leiomyosarcoma: a population-based epidemiologic and prognostic study of 48 patients, including cellular DNA content. Cancer. 1992;70(1):114-9. Mankin HJ, Casas-Ganem J, Kim JI, et al. Leiomyosarcoma of somatic soft tissues. Clin Orthop Relat Res. 2004;Apr(421):225-31. Golden T, Stout AP. Smooth muscle tumors of the gastrointestinal tract and retroperitoneal tissues. Surg Gynecol Obstet. 1941;73:784. Meng Wang, Xiaoping Gu, Zhengliang Ma, et al. 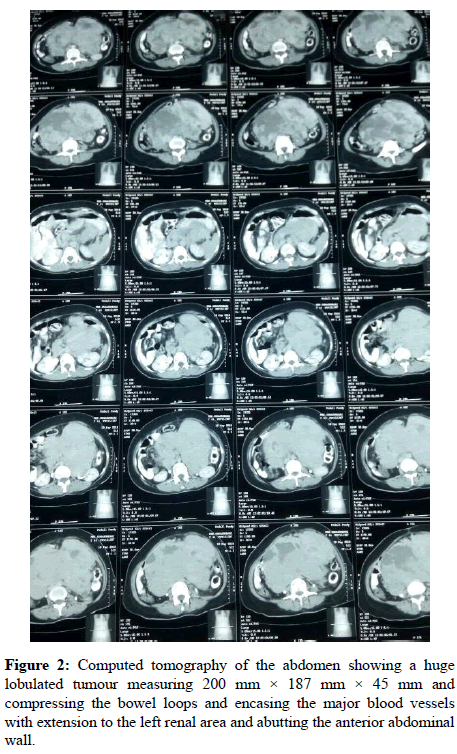 Anaesthetic management of a patient with giant retroperitoneal liposarcoma: case report with literature review. Int J Clin Exp Med. 2015; 8(10):19530-34. Mishra S, Joshi S. Anaesthetic management of a case of retroperitoneal tumor with pemphigus vulgaris with multiple comorbid conditions. Egypt J Anaesth. 2016;32(1):151-3. Zhu X, Gui Y, Zhu B, et al. Aanesthetic management of a patient with 10 l of blood loss during operation for a retroperitoneal mass. Egypt J Anaesth. 2015;31(2):207-13. Ramani M, Purkayastha M, Jain M, et al. ijcpcr. 2015;6(1):24-6. Hashimoto Y, Hatakeyama S, Tachiwada T, et al. Surgical treatment of a giant liposarcoma in a Japanese man. Adv Urol. 2010;3. McCallum OJ, Burke JJ 2nd, Childs AJ, et al. Retroperitoneal liposarcoma weighing over one hundred pound with review of the literature. Gynecol Oncol. 2006;103(3):1152-4. Han HH, Choi KH, Kim DS, et al. Retroperitoneal Giant Liposarcoma. Korean J Urol. 2010 Aug; 51(8):579-82. Bautista N, Su W, O'Connell TX. Retroperitoneal soft-tissue sarcomas: prognosis and treatment of primary and recurrent disease. Am Surg. 2000;66(9):832-6. Johansson PI, Ostrowski SR, Secher NH. Management of major blood loss: an update Acta Anaesthesiol Scand. 2010;54(9):1039-49. Hard JF, de Moerloose P, Samama CM. Massive transfusion and coagulopathy: pathophysiology and implications for clinical management. Can J Anaesth. 2006;53(6):40-58. Santry HP, Alam HB. Fluid resuscitation: past, present, and the future. Shock. 2010;33(3):229-41. Borgman MA, Spinella PC, Perkins JG, et al. The ratio of blood products transfused affects mortality in patients receiving massive transfusions at a combat support hospital. J Trauma. 2007;63(4): 805-13.